Are you ready for one of the greatest shows on earth?? There's nothing as fun as going to the circus, and the highlight of the performance is definitely all of the silly clowns. Isn't it a blast to watch them make monsters out of balloons, or do their famous knife juggling act, or pull a dead rabbit out of a hat? We don't get what all the fuss is about clowns. They're just trying to entertain us, not scare us! Putting on your own fun show is easy when you wear this Clooney Clown w/ Teeth Mask to your party! 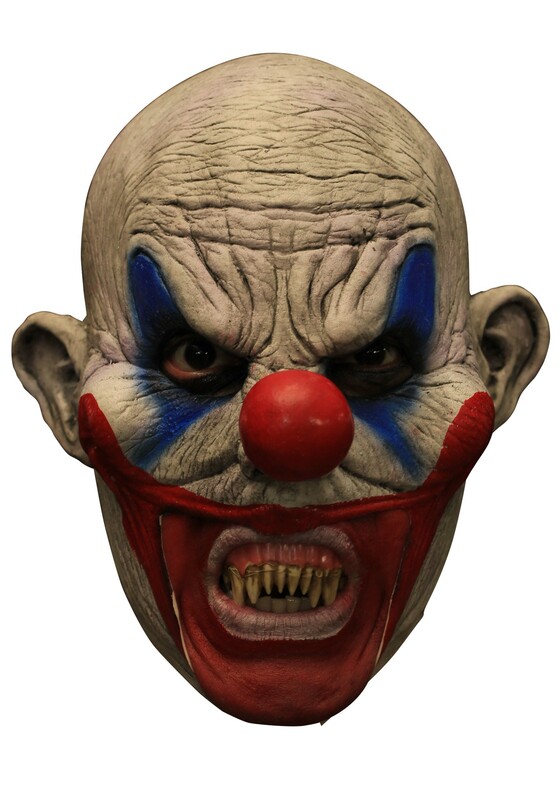 This unique mask gives you the look of a bald, kooky clown with a bit of a sinister side. It already comes with an attached red clown nose and painted on makeup, and the lower half of the face is open so you can show off how creepy the included jagged yellow teeth make your mouth look. Wear it with your most gruesome circus costume, and give your friends some clown memories that will last a lifetime!